Savile Alam is a Dunmer who can be found in Saint Delyn Plaza in Vivec City. She has reported on troubles with Daedra at the shrine of Ashalmawia, and has come to Vivec to rest up, resupply and enlist aid. "I came here to rest and repair my gear, not chit-chat with Outlanders." "No end to those fetching Daedra. Cut one down, three more are summoned in its place. Traylan send you, or you just attracted to the scent of Daedra blood?" Yes, he said you could tell me about Ashalmawia. "Hmph. I'm no tour guide. What's happening at the shrine? "The Worm Cult is trying to fill this world with Molag Bal's corruptions. The Tribunal have protected Vvardenfell from his Dark Anchors, but that hasn't stopped his thralls from doing all they can. Like using an ancient shrine to summon his minions." "Molag Bal's plans to drag this world into Oblivion may have failed, but that hasn't stopped the Worm Cult from trying to fill this world with corruption. Now they're channeling the power of Ashalmawia's shrine to summon Daedra. No end to them." I pried my soul from the clutches of Molag Bal. A few minor Daedra won't trouble me. "That's the second boldest claim I've ever heard. If there's truth to it, be my guest and squash those vermin. 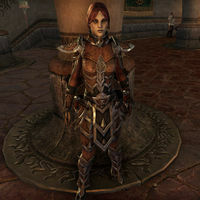 I've had my fill of Daedra for a long while." Why aren't you going in and disrupting the rituals? "What do you take me for, a pretender? Aside from the outlanders quick to brag and quicker to die, I am the only thing keeping Bal's minions confined to Ashalmawia. I came to Vivec for resupply and to enlist some help." Will disrupting the rituals be enough to stop the Worm Cult? "It'll have to do. Even if you killed every Worm Cultist in the place, there will always be some other stupid fetcher waiting to meddle with a Daedric Shrine. Just have to stay vigilant." What kind of Daedra are they summoning? "Any and all. So far it's mostly been scamps or the odd clannfear poking out from the ruins, but the sounds I've heard echoing out of that place are fetching troubling. I think the cultists are becoming more practiced with their summoning." "Things seem quieter around Ashalmawia. Should I be thanking you for that?" I was able to stop the Daedra summoning rituals. "Vivec's might spear, you're serious. I should be jealous, but truth be told I had my hands full just culling the Daedra that escaped the Sunken Vaults. Thanks for putting an end to those Worm Cult s'wits. I can handle cleaning up the stragglers." "The good thing about Worm Cultists is that they provide me with plenty of stinking Daedra to send back to Oblivion." This page was last modified on 11 February 2019, at 23:42.